After the 5-0 demolition of Huddersfield Town, Maurizio Sarri heaped praise for Gonzalo Higuain and Eden Hazard, saying that he can already see a blossoming relationship between the duo. The Italian is confident that the two attackers could fire Chelsea up the table this season. 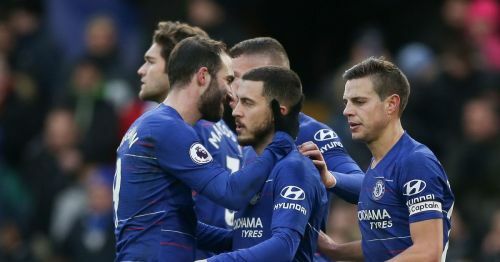 After their loss to Bournemouth last week, Chelsea returned back to winning ways by beating Huddersfield 5-0 in their Premier League game at Stamford Bridge. Chelsea's latest signing, Gonzalo Higuain scored a brace on his home debut and Eden Hazard added two to his goal tally as well. Both players linked up well during the game and showed glimpses of what their partnership can achieve together. The Londoners are currently fourth on the Premier League table will be looking forward to finishing in the Champions League qualification places for the next season. However, they face tough competition from Arsenal and Manchester United and Maurizio Sarri's team needs to gain some consistency in order to fulfil their ambitions. "I know very well that, when he arrived, he wasn't at the top of his physical condition," Sarri said. "Now he is improving. I'm really very happy because, apart from the goals, my feeling is he's really suitable to play very close to Eden. "I think that, on the pitch, they are really very suitable to play one close to the other. For us, this is very useful for Higuain because he will be able to score a lot of goals, but also for Eden. Chelsea next play Manchester City in the league before making a trip to Sweden to play Malmo FF for the first leg of the UEFA Europa League RO32.